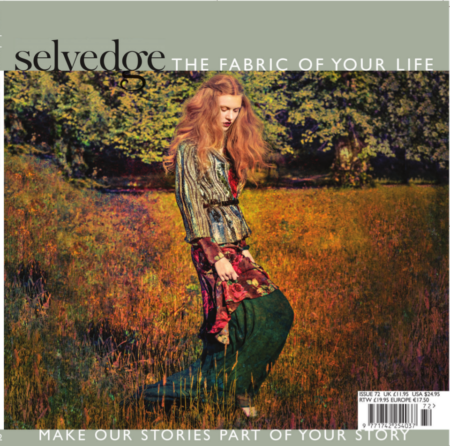 Back in 2002, I discovered selvedge magazine, in the art department of Bedford High School, UK, where I taught fashion, design technology and art history. I was immediately attracted to everything about it, from the paper it was printed on, to the gorgeous photographs and fantastic content. It was a revelation and has been a huge source of inspiration ever since. I have visited their office on Archway Road, visited their stand at various textile fairs and met the founder Polly Leonard, at her presentation at Liberty of London recently. It will come as no surprise then that I was overjoyed when my review of the amazing exhibition, Fashion Forward, at the Musée des Arts Décoratifs, in Paris, was published in this current issue; 72. Hope you enjoy reading…..